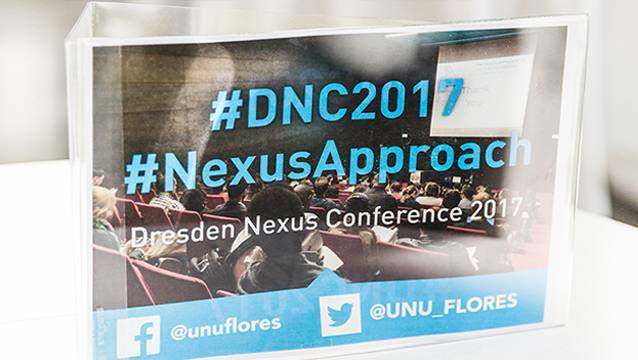 During the Dresden Nexus Conference 2017 (17–19 May), participants engaged actively in Q&A sessions, parallel sessions, and the World Café, among other things. Beyond the physical sessions, discussions also took place in the virtual realm. Two side events at DNC2017 were livestreamed on Facebook Live to over 150 remote viewers. Visit our Facebook page for the videos featuring the launch event of the Nexus Observatory collaboration and the launch of the book Multifunctional Land-Use Systems for Managing the Nexus of Environmental Resources (Springer). On Twitter, participants shared insights on the conference content using the hashtags #DNC2017 and #NexusApproach. Over the whole period, more than 400 tweets were published with these hashtags related to the conference. At the heart of DNC2017 was the question, how the Nexus Approach can contribute to the implementation of the Sustainable Development Goals (SDGs) and how monitoring measures are involved. In particular, the aspects of implementation and monitoring focused on examples related to multifunctional land-use systems and resource management in resilient cities and urban areas, as well as cross-thematic content. Especially during parallel sessions, the live tweets helped other participants keep tabs on the other sessions that they were not able to physically attend. Exhibitors, too, took the opportunity to be part of the social media buzz. Ultimately, it was heartening to see the spirit of DNC2017 that is going down to the human dimension – incorporating socioeconomic perspectives and connecting stakeholders – also embodied on the conference Twitter feed. We would like to thank all participants who have actively participated in the conversations virtually!